With the SANFL continuing over the weekend, 2017 South Australian draft talent was on show at League, Reserves and U18s Level. The South Australian U18 squad had their first trial game, while scouts were drawn to some of the prospects playing school football. Mitch Crowden (Sturt) had a strong performance playing some more midfield minutes, racking up 18 disposals including a goal from his work in the centre in his teams win over North Adelaide. 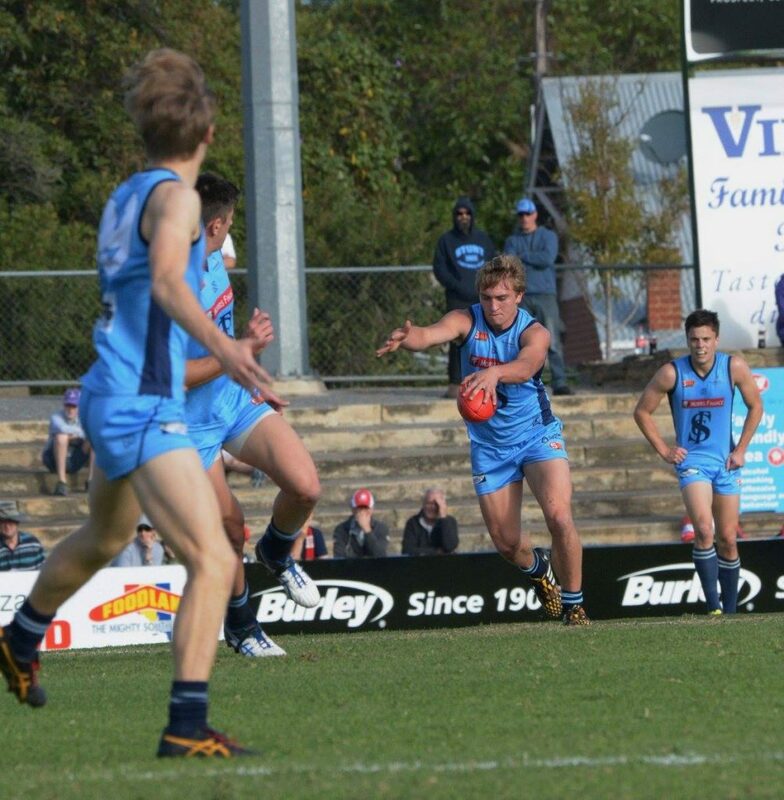 This resulted in his nomination for the SANFL league Powerade Breakthrough Player of the Year. Alex Martini (Glenelg) had 12 disposals playing as the link through half back, continuing his consistent year in the league team. Darcy Fogarty (Glenelg) was again quiet and didn’t have an impact on the game in Glenelg’s loss to Norwood. Connor Rozee (North Adelaide) as an underager had 15 disposals, including two goals and laid nine tackles in a solid performance. Jackson Edwards (Glenelg) had 19 disposals in their close loss against Norwood. Stefan Giro (Norwood) was best on ground with 27 disposals, nine marks, six tackles and booted two goals. Teammate Lachie Pascoe was again consistent rebounding from down back with 23 disposals including 10 marks. Isaac Hewson returned to the Norwood reserves team with 15 disposals. State Squad Members not playing in the trial included exciting bottom-age forward Jack Lukosius. He collected 23 disposals, clunked 10 marks and booted four goals to be in the bests for Woodville-West Torrens. Thomas Schmusch was also in the best with 21 disposals, 10 marks and a goal. Other notable performances for the round included Ed Allan who was nominated as the Round 6 Torrens University Australia Cup MVP. Allan had 41 disposals, laid eight tackles and booted two goals. Teammate Adam Ternorden also found plenty of the ball, collecting 37 disposals. For Norwood, Harrison George (38 disposals) was strong in their loss to Glenelg. Mitchell Mead (Woodville-West Torrens) had 34 disposals in a best on ground performance against West Adelaide. On the opposing side, Patrick Fairlie took 15 marks to go with his 31 disposals. SA went down to Tasmania, who were coming off their own Under 18 Academy Series campaign. The Mariners were strong and brutish compared to the SA lineup. The SA Selectors had the opportunity to look at the full squad, leaving the likely players for the Under 18 Championships in the SANFL allowing to help them trim down the squad. As has been reported (SOUTH AUSTRALIA DEFEATED IN FIRST UNDER 18 TRIAL) best for SA included Jakob Heitmann, Harrison Petty, Jake Weideman, Jimmy Rowe, Jackson Hately and Josh Smithson. A number of State Squad members were on display. Prince Alfred College dominated Immanuel College by 80 points with clear best on ground Allies squad member Zac Bailey (Northern Territory) – the midfield clearance machine was dominant in not only winning the ball from the clearances but using his pace to break free of the contest to drive the ball inside 50. He also spent the last quarter up forward and showed some great defensive pressure. Hugo Barry was also in the bests for PAC with his contested marking up forward. Tall forward Sam Davis (Immanuel) was among his teams best starting in the midfield.